So I’ve just finished implementing a basic color picker control. Here, I have it hooked up to the fog color. Next step will be putting these into popups, so they don’t take up so much screen space. These will be wired up to lots of things eventually (terrain, sky, object editors, etc), and I don’t really want them drawing at full size all the time. I’m also starting to play with new GUI appearances — moving away from the “glowing lines over dark blue” theme that I’ve been using since the original release of MMORPG Tycoon. Haven’t really picked anything specific yet, but I’m still experimenting. Connected to this, I’ve added an HSV interface onto the vsColor class. I’ll port that back into the VectorStorm trunk codebase soon. Hopefully, this will be the last time I need to manually port these sorts of changes back; the big restructuring of VectorStorm that I talked about in the previous post should make this unnecessary in future. 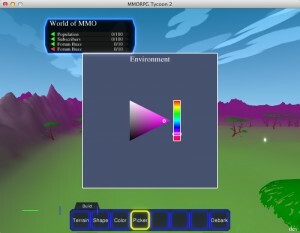 22 March, 2012 in Full Games, MMORPG Tycoon.